Oxidative stress has been associated with low birth weight, preterm delivery, and preeclampsia, all important negative maternal or neonatal outcomes of pregnancy. Vitamin E, specifically RRR-α-tocopherol, has potent antioxidant effects that may help mitigate these risks if intake is optimal during pregnancy. Many complications of pregnancy and the neonatal period are augmented by inflammation making the task of defining optimal vitamin E status and antioxidant capacity during pregnancy a worthwhile endeavor. Clinical supplementation trials of vitamin E during pregnancy as reviewed by a 2015 Cochrane review are inconclusive or draw contradictory conclusions and have designs that do not lead to robust data for analysis. Additional information regarding placental regulation of α- and γ-tocopherols, fetal tissue incorporation, and fetal serum concentrations of tocopherol metabolites are other areas for continued research. 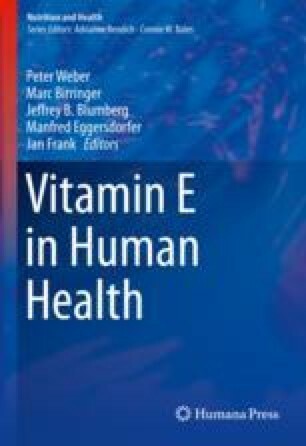 A more complete understanding of vitamin E status of the pregnant woman and its impact on the developing fetus as well as associations with pregnancy outcomes such as length of gestation, mode of delivery, and associations with preeclampsia, pregnancy-induced hypertension, and gestational diabetes is critical to improving pregnancy outcomes. Considerable scientific work remains necessary to fully understand the role of vitamin E in fertility and pregnancy and its ability to optimize maternal and neonatal outcomes. We would like to gratefully acknowledge the help of Ammar Kamil and Matthew VanOrmer for their help in the preparation of this chapter. American College of Obstetricians and Gynecologists. Preeclampsia and hypertension in pregnancy: resource overview. https://www.acog.org/Womens-Health/Preeclampsia-and-Hypertension-in-Pregnancy. Accessed 26 Oct 2017. Devereux G, Barker RN, Seaton A. Antenatal determinants of neonatal immune responses to allergens. Clin Exp Allergy. 2002;32:43–50. https://doi.org/10.1046/j.0022-0477.2001.01267.x. Hanson C, Lyden E, Furtado J, Van Ormer M, Johnson R, McGinn E, Cave C, Rilett K, Weishaar K, Maddipati S, Appeah H, Anderson-Berry A. Vitamin E status and associations in maternal-infant dyads in the Midwestern United States. Clin Nutr. 2018; https://doi.org/10.1016/j.clnu.2018.02.003. Heaney RP, Davies KM, Recker RR, Packard PT. Long-term consistency of nutrient intakes in humans. J Nutr. 1990;120:869–75. https://doi.org/10.1093/jn/120.8.869. Kaempf-Rotzoll DE, Horiguchi M, Hashiguchi K, Aoki J, Tamai H, Linderkamp O, et al. Human placental trophoblast cells express alpha-tocopherol transfer protein. Placenta. 2003; 24:439–444. https://doi.org/10.1053/plac.2002.0966. Miller GW, Ulatowski L, Labut EM, Lebold KM, Manor D, Atkinson J, et al. The alpha-tocopherol transfer protein is essential for vertebrate embryogenesis. PLoS One. 2012b;7:–e47402. https://doi.org/10.1371/journal.pone.0047402. Pressman EK, Cavanaugh JL, Mingione M, Norkus EP, Woods JR. Effects of maternal antioxidant supplementation on maternal and fetal antioxidant levels: a randomized, double-blind study. Am J Obstet Gynecol. 2003;189:1720–5. https://doi.org/10.1016/S0002-9378(03)00858-5. Rumbold A, Ota E, Nagata C, Shahrook S, Crowther CA. Vitamin C supplementation in pregnancy. Cochrane Database Syst Rev. 2015;9 https://doi.org/10.1002/14651858.CD004072.pub3.